During wartime, it was expected of everyone to put all their efforts toward winning the war. This often meant working harder and making extra effort. The Make Do and Mend campaign encouraged people to make new by using material from old clothing. Make-do and Mend classes were also set up. These classes taught people how to give their old clothing a new lease of life and make their rations go further. Rations were introduced due to a shortage in supplies. 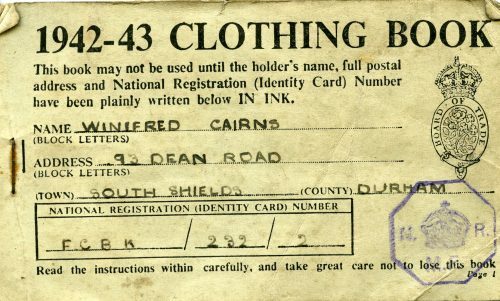 Each person would be provided with a rations book which contained coupons used to purchase clothing and food. Children’s clothing often saw a lot of wear and tear; the solution to this during a time of ‘make do and mend’ was to reinforce the clothing so that it may last longer. 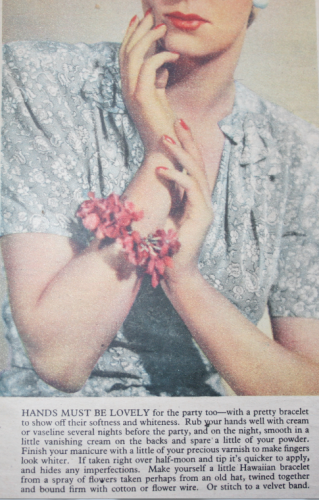 Magazines would often include tips on how this could be done using simple techniques as shown below in the magazine Woman from April 1943. 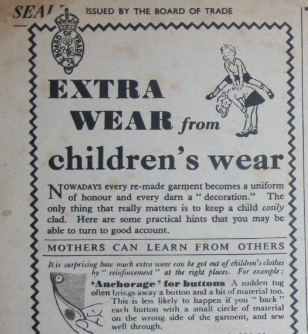 10 April 1943 issue of Woman magazine: Tips on Children’s Clothing. Despite rations and other wartime restrictions, life appeared to remain relatively normal for some. 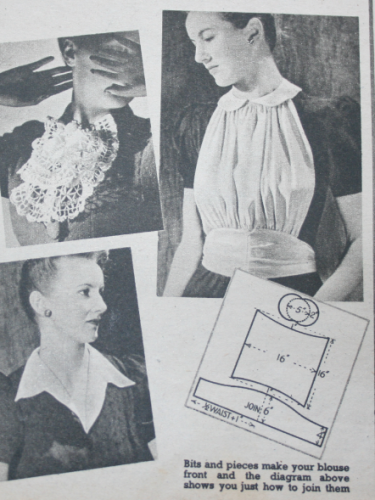 Parties would still take place and people were encouraged to add frills and scrap material to their dresses to create the perfect party dress. They were encouraged to accessorise with flower bracelets which could be recycled from flowers taken from old hats as can be seen below. 2 October 1943 issue of Woman magazine: Tips on how to dress for a party. To conclude, wartime brought with it fewer resources and a change in attitude towards consumerism which encouraged people to be more imaginative with what they had rather than to buy new. It was an age of make-do and mend.